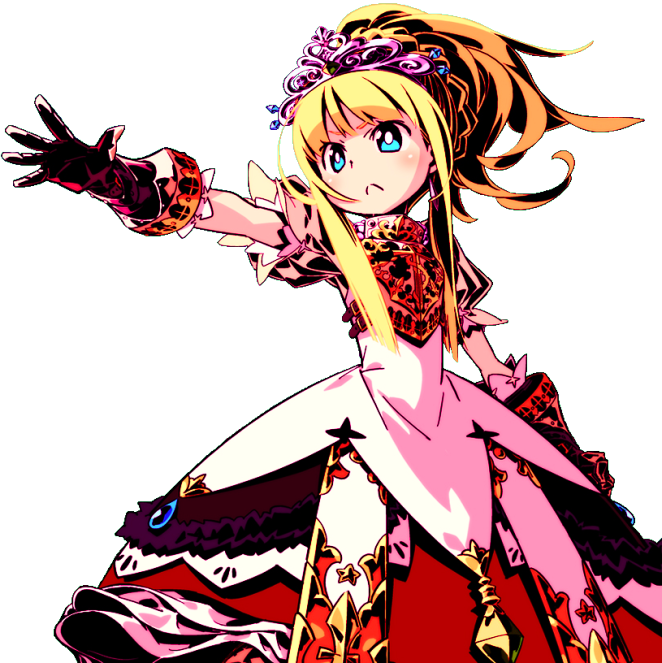 Welcome to the Etrian Odyssey Community Thread! This is where explorers pool their talents. It's something like a mutual aid society. ATLUS on the Nintendo DS and 3DS for those gamers who are explorers at heart. preparation, but also often rewards experimentation and thinking outside the box. have no strong ties to each other so you can play them in any order. walls, doors, treasures, pitfalls, enemies, and even free-form text notes. mapping does most of tedious stuff and you just need to mark special icons or notes. ways its remake renders this original irrelevant, this is where it all started back in 2007.
the first game but adds a few classes and improvements to game balance and interface. which are still unique to the game as of this writing. a better implemented and balanced subclassing system were introduced. game balance has been adjusted to account for the now-standard level cap of 99.
minimalistic story (by spoiling the entire thing right from the get-go). Please refer to FAQ section below for an important note about game modes in EOU. in the series to have DLC. NA release for late 2017. Enhanced character creation is a highlight of this new entry. characters from the casts of P3 and P4 into EO-style dungeon exploration. game in the Mystery Dungeon series that will feature Etrian Odyssey influence and characters. This game is a rogue-like (or rogue-"lite") rather than have traditional EO gameplay. A sequel to the first EMD game with new classes, features, dungeons, and story. Releases Summer 2017 in Japan. 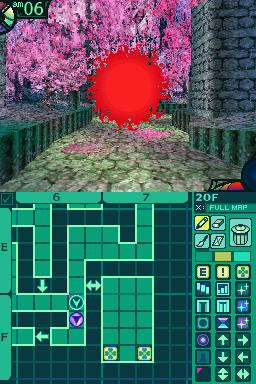 Battles in Etrian Odyssey games are turn-based and encounters are, besides bosses, random. passes while in battle just like it does while you are walking around the labyrinth. players, there are some specific things worth noting about the battle system. FOE stands for Formido Oppugnatura Exsequens in English, or Field On Enemy in Japan. However, this meaning can basically be ignored. The true meaning of FOE is fear. powerful enemies that roam the labyrinth on the field itself (thus the Japanese name). to kill your entire party in their current state, much less two of them! the FOEs that previously frustrated your efforts. system. Death > Curse > Poison > Sleep > Panic > Paralyze > Blind (at least as of EO4). weaknesses. The one exception is Untyped; nothing is resistant or weak to Untyped. prepare for tough fights by equipping proper protective gear in advance. not count as status ailments and a target can have up to three binds applied at once. things like magic skills and other "verbal" things like taunt and charge). Arm Bind - Lowers STR and also disables any arm-based skills. Leg Bind - Nullifies evasion, prevents Flee, lowers AGI, and also disables any leg-based skills. shortest duration remaining is replaced. Same for debuffs. attack when an ally hits an enemy. Effective use of chasers can be quite powerful. including conditional drops, no matter how you finish them off. important thing to know about critical hits is that only normal attacks can crit! intuitive, a tank is often best off in the back row when taking hits for the party. utilizing that can be especially important in boss fights. that may or may not be affected by turn speed. something unorthodox and make it work. this series is that many party builds can work and there is no real "magic bullet" or "best"
party except for in some specific situations. guild and most of your stuff. but does not allow you to use your classic mode characters in a story mode game. start another NG+ into classic you'll have everyone back! subclass selection in EO3 and EO4, allowing you to pick a new one. Retiring is basically the changing class feature of Etrian Odyssey, implemented thematically. once you have retired a character at max level you can't get any more bonuses. 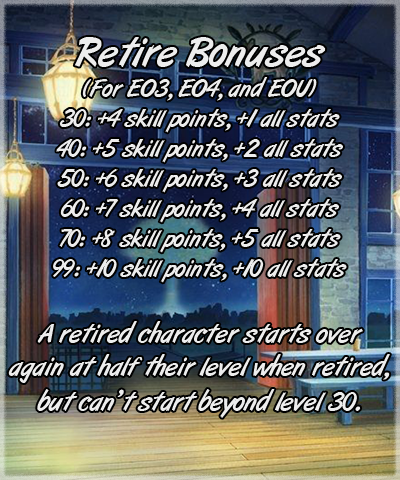 and Untold, but the level cap system in EO2 is different, which impacts retiring. your party members. This gives 5 bonus skill points and access to most skills from that class. can be used to give additional or enhanced role functionality to a party member. to be raised to half of their max rank for better class balance. Is "Fight and Heal" some kind of inside joke? - It comes from an old Game Informer "review"
of the original EO game where the unimaginative reviewer named his party members Fight and Heal. the best balanced and most newbie-friendly game in the series, excluding the Untold remakes. just know that EO1-4 do not have all the same features (floor jump and running, to name a couple). Help! I can't kill Hollow Queen in EO4! - Leg bind! are games like Dungeon Travelers (Vita) and SMT Strange Journey (NDS). How do the game modes work in EOU? Do I need to play one or the other first? What about NG+? and grimoires, even between game modes!!! game modes interact so here are the details. get the drop required to make the best katana in the game...which you can't even use in Story mode! You can form any party you want, except no Gunner or Highlander (EO1) or Fafnir (EO2). mode, so you do not need to play Story mode to get 100% item/monster data like you do in EOU1. 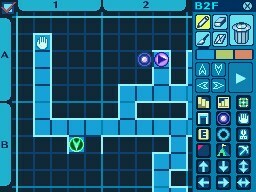 Into the Labyrinth - Fansite where you can find the helpful Skill Calculator programs for EO3 and EO4. Guild card generator for EOIV - Get your guild card images off your 3DS SD card first. The pictures all seem OK.
Of course Mau would be first. Princess is still the best class. Nice to see the thread's up and running again. Hating on FM is bannable here. Nice to see you all in here. The niche game community continues! I'll continue to deliver with such silly things as my double nightseeker team if possible, dunno if I'm good enough to mess around like that all the time but it was definitely fun. Just started EOU1 in story mode two days ago. Barely scratched the surface, and I'm probably building my party wrong. Oh well, I'm not even playing on expert, so it will be fine! I can never not hear A Sudden Gust of Wind Before Your Eyes when I see this gif. Also: IOSYS FOE vid, because every EO OT needs it. Already linked in the OP, don't worry! I'm going to give myself six months to finish EOU1, EOU2, EO V, and Persona Q.
I don't expect to buy EO V until December, so... I should play PQ for a while? PQ or any of the other EO games you haven't played yet! I have EOV in it's shrink-wrap as I'm still working on EOIII. Damn this boss fight on BF10! I've only beat the original EO and put about 40 hours into EOIV until I lost my save data, but I adore the series. Recently watched Made in Abyss and enjoyed it outside of some of it's more questionable content. Is there a discord for this community? I need some serious EOII help. First post for me on ERA! Havent had much time to jump into EO5, havent been too excited with the world or classes, but still in the first area. Still hoping for an EO3 remake. Loved the theme and overworld with boat exploration! Ah, finally. Since I continued my EO 3 solo princess run I may actually post in here. Still waiting for my copy of EO5. For once shipping from Amazon is taking its sweet time (importing). Ah well, at least there was an extensive demo, so I got to play the game a little bit already. Plus I'll get to play the game with the FM music immediately. This is the community I've been waiting for! Nice to see the Etrian Odyssey community is back! Haven't made too much progress in EOV as I'm still in the 2nd stratum on floor 9 (damn you Fire Emblem Warriors!!). The enemies can be a problem at times, but are still manageable for the most part. Also I can't seem to figure out the niche for the Harbinger. Any tips/advice? What "must-have" skills should I be putting points into? ay, we made it over! welcome back, everyone! on floor 23 is nuts. Hi everyone, made it over here, looking forward to discussing EOV when it releases here! I'm alive! Just not as active on this forum right now. It's just easier to chat on Discord, haha. Hello everyone. I might have replied in this community before but then stopped doing so. I'm going to try to be more active here. Currently playing EMD, I completed the story mode and am trying to do the post-story content. It always felt like EMD is not talked about as much as the main EO games. This surprises me because I feel like it does its own thing while still having the good things of EO. Are there any fans out here? Are there any fans out here? Some members probably like it but in general it's not a game we talk about much. Personally, I'm not a fan of EOMD. EMD is pretty neat in theory, but there are some glaring design flaws that makes it kind of the black sheep of the franchise, namely the party AI, and the DOEs. I didn't like EMD, but I don't like Roguelikes and Mystery Dungeons anyway, so I wasn't the target market lol. I quite enjoyed EMD with the forts and reserve teams locking down a Dungeon, but I can’t say I see it discussed much anywhere. I've never played EMD, dunno if I want to since I'd rather just play Shiren. Thank you for the warm welcome. EO3U sounds like a no brainer but the comment about the last EO 3DS game being a festival kind has me worried. Let's hope for the best. I definitely agree about the party AI, though I started to get better at controlling them with the burst skills and items that teleport you back to the stairs. There are still times where I can get screwed. As for the DOE's, do you mean because they're too easy? It might have been my first MD game and it was a good experience. I also got Pokemon one and some vita games (Shiren and a cute looking one). Those are the reasons why I enjoyed it so much and how they made EMD distinct from the main ones. No, that they limit party composition. EO is about making any party composition viable, and forcing you to have status inflicters goes against the spirit of the series. EMD wasn't really my thing. I also couldn't get into Pokemon Mystery Dungeon or Izuna, so I guess I'm just not into these games. I love the town theme, though. I see what you mean. I found a way for that. There are many gels in the game that inflict ailments. I've hoarded so many that it is easy to take them on even without members that can inflict ailments. If I remember correctly though, almost every party member has skills that work on a DOE, the fighters (Landsknecht?) have link skills that work as status ailments, protectors have bash skills, medics too, gunners bind skills that also work, wanderer slow skill...I think only the dancer and sovereign might not have any usefull skills. It is easy to have a combination of party members with enough skills to get rid of a barrier along with gels if that is not the case. I think my main party was Landsknecht, Protector, Gunner, Medic, and it got along just fine. The only class I really felt was essential was the Protector, and even then, reading other players experiences, it depends on your style of play, mine was obviously a traditional ‘aggro with the knight while the gunner debuffs and the warrior inflicts heavy damage’ setup. With only four party members there was even less room for ‘dead weight’ than the main series, and so I think most classes could contribute something. I love Mystery Dungeon games but EMD just wasn't a very good MD game or a good Etrian game. Mystery Dungeon games are great, but EMD was so hard and evil with it's difficulty that I stopped playing it after a while. I quit because a DOE killed my team and all party members lost their weapons (that I worked incredibly hard for) while another DOE on the top floor of the dungeon I was exploring, got out and destroyed the inn which was level 3 at the time. Lost 50+ stored items, just like that. I was livid. Oh yes...what I also like is that there is less grinding and you can experiment more freely because all the party members level up with you (the main games would be awesome if they did this too). I can go anywhere without fearing that a DOE might reach town because I always have forts with party members that are ready to strike down and finish the job on their own. I only have party members with distinct jobs (so 10 total?) and it works out great. The party that I use to explore: protector (they are indeed a must), mage, medic and wanderer. And lastly I like that it's 3D and that you can see your party members. I don't prefer it over first person few but it does makes it its own game. I'll probably get EMD2 despite hearing it doesn't really improve anything on EMD, because I'm a stupid sheep who's a sucker for anything Etrian Odyssey at this point. Hi, new players here. Trudging along with EOIV now. Nice to meet you guys. I'd love to get invited to EO discord as well. What do you think about EOV? Personally, I'm not too hot about it. I feel map-making section is less enjoyable compared to EOIV, and I'm a little annoyed that I can't change the character portrait with the reclassing option.It makes for funny character like shaman with armor.